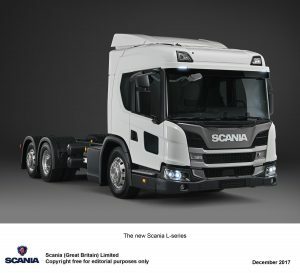 Scania has introduced the last new models in its Next Generation range with the unveiling of a new L-series, with an entirely new low-entry cab series designed for urban environment applications such as local distribution, waste and construction. To facilitate safe and easy access and egress, the new cab can be specified with automatic kneeling to give a single 440mm entry step on both sides of the cab. With up to three passenger areas, movement around the inside of the cab is also easy. All L-series cabs are 2,000mm long and available in three roof heights; low, normal and high. In addition to being low mounted, the boarding step on an L-series cab is 790mm wide. The optional kneeling facility permits single-step entry via a floor well, with the cab floor height itself being approximately 800mm from the ground, depending on tyre choice. Without kneeling, a second boarding step is fitted, with the cab floor height being approximately 930mm. Movement around the interior is assisted by a passageway in front of the engine tunnel connecting the driver and passenger areas of the cab. The L-series is powered by Scania’s updated 9.3-litre engine, which is available in three different power outputs for diesel – 280, 320 and 360hp. During 2018, Scania will also add its OC09 dedicated gas-fuelled engine in two power outputs of 280 and 340hp (and for both CNG and LNG) to the engine range for the L-series. All engines can be combined with Scania Opticruise or with an Allison automatic gearbox. In terms of enhanced safety for operation in urban areas, the low datum height L-series helps the driver detect vulnerable road users such as cyclists and pedestrians more easily. The driver’s vision can be further assisted by the fitment of an optional Scania City Safe Window in the passenger door.